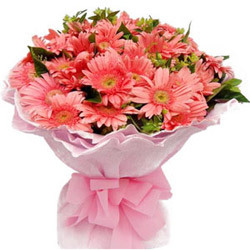 Order online this Breeding Luminance Gerberas Bouquet for your beloved and give a spark to the stuffed-by-work passion which thrives 24x7 between you two. This is a lively Bouquet of spruce 15 Pink Gerberas clustered together by a prim Pink Tissue exhibiting a Bow Pattern. Elect this Growing Allure Gerberas Bouquet to greet the novel bride of your family and tie with her through a fragrant fervor. This is an appealing Posy of pretty 20 Pink Gerberas aligned together by a nifty Pink Tissue flaunting a Bow Texture.